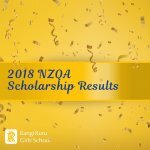 We are thrilled with the outcome of the 2018 NZQA Scholarship Examinations. These examinations test high-level critical thinking in addition to specific subject knowledge, and we admire the combination of attributes acknowledged in these awards. These results are achieved at two levels, ‘Scholarship’ and ‘Outstanding Performance Scholarship’. From the 2018 Scholarship exams, the girls gained 26 Scholarships including 6 Outstanding Performance Scholarships. Two of these were Year 12 students. Five girls gained three Scholarships each and two gained two each. Our warmest congratulations to these girls on their NZ Scholarships. With appreciation and thanks to Assistant Principal Curriculum Ms Juliet Collins and her teaching team for their outstanding work in supporting and encouraging the girls through their NCEA.